In the anime series Sword Art Online, Asuna wields a rapier which, along with her speed, earns her the nickname Flash. Officially licensed, this Lambent Light Cosplay Sword makes a glorious addition to any Asuna costume ensemble. Crafted from dense latex foam with a unique fiberglass fusion core, this Anime costume sword is lightweight and extremely flexible. The durable latex construction with painted details provides a realistic look for any cosplay or theatrical production. The narrow silver blade is embellished with a pale green and silver accent that wraps around the base of the blade. 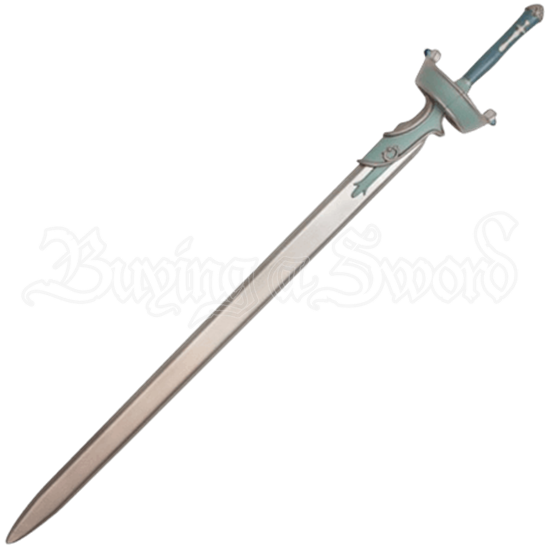 A pale green and silver cup hilt with blue jewels protects the hand. The aqua grip is decorated with silver sword motifs and is capped with a silver pommel. Perfect for an anime or costume convention, this Elucidator Cosplay Sword is suitable for light sparring.